ARE PCA PASTOR AND DAUGHTER TEACHING THE TRANSGENDER TWO-STEP ? Join us for this annual community-wide event featuring Faith for Justice, the City Ministry Initiative, Action St. Louis, and Close the Workhouse as they teach us how to carry and continue the legacy of Dr. King. Free food and childcare will be provided. Please consider bringing a side dish to share or donating to help with food. PRESBYTERIAN CHURCH IN AMERICA HOSTING TRANS – INSANITY ? South City Church pastor is Mike Higgins who is also Dean Of Students and teaches “Applied Theology” at PCA’s Covenant Seminary . Mike and Renee Higgins came to South City Church in 2012. Mike attended Covenant Seminary earned his MDiv in 1996 and served as a PCA pastor in Chattanooga, Tennessee and Atlanta, Georgia before returning to Covenant Seminary as Dean of Students in 2011. He is also an army chaplain (COL) assigned to the Pentagon. In May 2012, Mike earned his DMin from Covenant where his focus was the “Experiences of African American Church Planters in the PCA.” He has been married to Renee for 33 years, has two daughters, Mary and Michelle and two grandchildren, Moses and Mattie. ADVOCATING DANCING WITH TRANSGENDERED . “Earlier today, we reported on a PCA church that is holding a Martin Luther King conference for the sole purpose of promoting transgender rights and activism. It has since been brought to my attention that Michelle Higgins, the “Director of Worship” and daughter of South City Church’s pastor Mike Higgins preached at the 2015 UCC Youth event and said some very disturbing things. The event was in part exposed on Twitter as having a transgender speaker .Here is the Faith for Justice event speakers bio . They have also been an outspoken advocate & organizer with movements such as Black Lives Matter, Black 4 Palestine, #NoDAPL and #SayHerName, among others. ..
THREAD: A PCA church is being taught by a woman in a lesbian relationship how to celebrate the lives of transgenders on an upcoming Lord’s Day. SHUFFLE ACROSS THE FLOOR -THE COVENANT TWO STEP ? Faith For Justice has announced the new venue – which is a PCUSA church . Faith for Justice is at Oak Hill Presbyterian Church – St. Louis, Missouri. WHO IS FAITH FOR JUSTICE ? Michelle Higgins is a founding member of Faith for Justice. She is an organizer, administrator and worship leader. She serves with Action Saint Louis, the Electoral Justice Project of the Movement for Black Lives, and directs worship for South City Church in Saint Louis. Michelle can also be heard on the podcast Truth’s Table. She earned an M.Div at Covenant Theological Seminary and currently works for campaigns centering Black radicalism in prison abolition and building political power. She lives with her family in Saint Louis. Mike Higgins Pastor of South City Church is the on the board of Faith For Justice with his daughter . 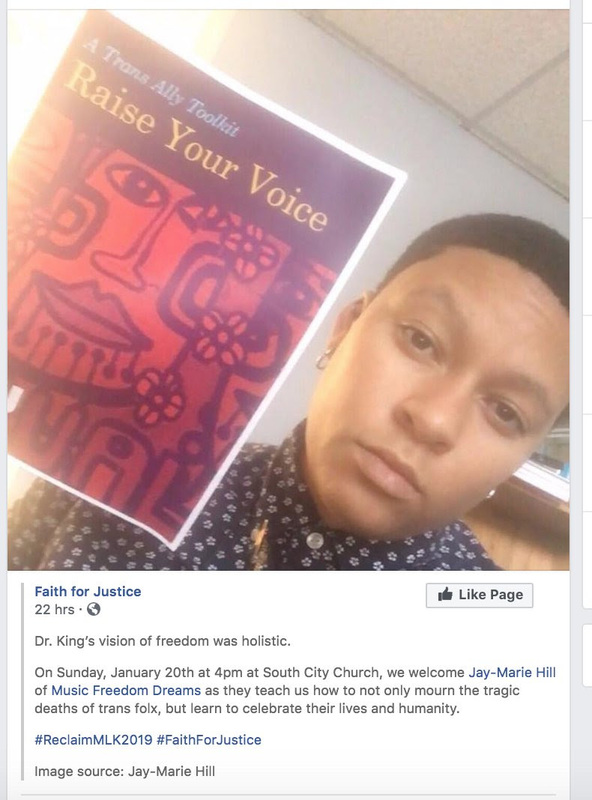 HOW CAN THE HIGGINS WHO OPERATE ON THE BOARD OF FAITH FOR JUSTICE NOT HAVE KNOWN ABOUT THE CONTENT OF THEIR OWN EVENT WHEN THEY THEMSELVES ARE BOTH STAFFERS AT SOUTH CITY CHURCH AS WELL AND WOULD HAVE BEEN INVOLVED IN MAKING THE DECISION TO HOST IT FROM THE START ? The PCA needs to get the bottom of what is going on in St Louis , in its churches and at Covenant Seminary . 43 :3 O send out thy light and thy truth: let them lead me; let them bring me unto thy holy hill, and to thy tabernacles. This entry was posted in Uncategorized on January 15, 2019 by revcoltom.